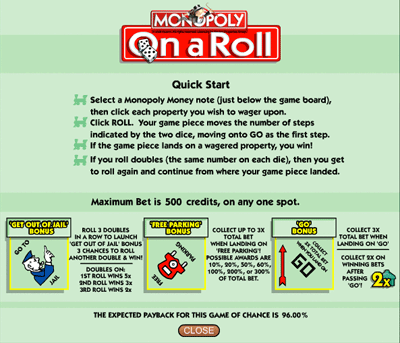 If you’re looking for a real money game closely based on the Monopoly board game, you’re not going to find it in "Monopoly On A Roll". 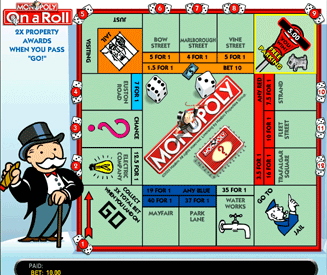 Monopoly On A Roll is more like a game of roulette on top of a Monopoly board. You’re not going to pass "Go", and you’re certainly not going to collect £200 with this one. In spite of all this, if you take Monopoly On A Roll for what it is, it’s not all that terrible. It’s an interesting combination of roulette and Monopoly, although if I wanted to play a game like roulette I’d probably just play roulette. Worth a play, but it’s no Monopoly, which is what we all want when we first see the screenshot if we’re being honest. Aside from all the disappointments, Monopoly On A Roll is an okay game. Even if it incorporates viritually zero elements of the orginal Monopoly board game in to this version, the streets and utilities bring back some warm memories of those never-ending nights in when the electricity goes off. Seeing as this game is just a Monopoly-ified version of roulette, I wish that there was more varitety when it comes to betting. Although there are a good number of streets with varying odds, it feels as though it’s missing that something extra in terms of betting options. Oh and one last thing, why don’t I get to pick my game piece? I’m always the car, always. How to play Monopoly On A Roll. Place your bets on the streets and utilties. Roll the dice and hope that you land on one of the squares you wagered on. No skill here, not even a few measly houses or hotels to play with. It’s a very straightforward game of chance. A slightly more detailed guide. 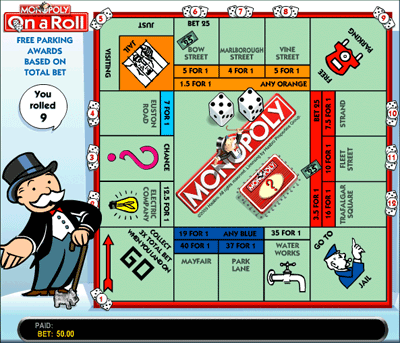 There are a number of different squares on the Monopoly board that you can place bets on. Each of these squares (made up of streets and utilities) has varying odds depending on how likely it is to land on it. After placing your bets you click to roll the die. After the die have stopped moving, your piece will move clockwise around the monopoly board starting at "Go". If the game piece lands on a street or utility that you placed a bet on, you win. Note: If you roll a double, you get to roll again and the game peice will cotninue from where it landed. Aside from the standard streets and utilties with their basic payouts, there are 5 "special" squares. These are the ones that do something a little different than the others. Chance. If you land on this, your peice will randomly advance to any square on the board. Just Visiting. If you land on this you automatically lose. You cannot wager on this square. Free Parking. This will reward you with up to 3x your total bet. The win is selected at random from the following payouts: 0.1x, 0.2x, 0.5x, 0.6x, 1.0x, 2.0x and 3.0x your total bet. Go To Jail. The "go to jail" bonus gives you the opportunity to win up to 5x your total bet by giving you the chance to roll a double in 3 rolls. Go. Win 3x your total bet if you land on this square, or 2x your total bet if you land on a wagered square after passing "Go" in one game.